Should DC bring back Diana's secret identity? Thread: Should DC bring back Diana's secret identity? Exactly. She could get the papers easily. Odds are Diana already had some kind of legal identification, considering how Themyscria had been played during those years as a political power. So Di probably had something akin to "ambassador" status, or at least a work visa or something , and could easily have gotten into some kind of co-op with the DMA. She's often been shown working with the military in various versions, so it's half expected of her anyway. But Diana didn't get the papers legally. She lied about her entire life using a fake identity someone had cooked up for her the day before. Does that not strike anyone else as being a tad out of the norm for her? I know "Diana Prince" was there from the start, and as part of Marston's creation it deserves to be considered and respected. But I really dont think it makes sense as we've come to understand the character today. I mean, a secret identity isn't the worst thing for Diana, even if I don't think it's necessary or fits the character. The Heinburg thing was just terrible though. And I didn't mean to clutter the thread with a debate about that era. I thought we had all agreed it was terrible, I didn't think commenting on it would be a thing. Heinberg wasn't that bad. It's the closest the book has ever been to the tv show and there was novelty in that. It was a good story that sold great, he just took too long to tell it. The purpose is to see Wonder Woman in a different light and put her in possible peril. She’s in peril as both WW and Diana Prince. She still has powers in both identities. The Diana Prince id instantly makes even a street level villain into a genuine threat if they catch her in the right guise. Why do we need to see a street level villain take down Diana? Especially how this tends to be universally reviled by fans? It provides far more storytelling potential and dramatic tension. We've seen Giganta tripped or entangled by the lasso a dozen times, but how would Diana Prince defeat her? The same way she does as WW. Despite many assertions to the contrary it does make her more relatable. She had a boss, co-workers and a job description like the rest of us, instead of running her own embassy with a White Room for teleportation. She had a boss who didn’t know who she really was and had interactions with only one co-worker who hated her and her job description was chasing her superhero alter ego. I don’t see what is so difficult to understand about being an ambassador in comparison. In addition she's able to express a full range of emotions, like doubt or fear that Wonder Woman rarely seems to feel. The two aspects make a complete person yet two very different kinds of Wonder Women. All of this has been done without the secret identity. If anything, she had less range with the Diana Prince i.d with 90% of her dialogue being about whether or not she’s human and 10% being about how no one likes her. That’s not being relatable. No she doesn't, Circe blessed her with the ability to turn into a normal person. She had to transform to access her powers. Variety, it makes villains like The Mask, THEM! and Mouse Man threatening. Suddenly foes that Wonder Woman could tear through with ease become formidable when facing Diana Prince. Diana Prince doesn't have a lasso, the ability to fly or super-strength. It's not about understanding, everyone understands what an ambassador does. It's about putting Diana in an environment where she has to be a Wonder Woman without relying on her powers. Not true either, 90% of her dialogue was 'Sam and Diane' banter with Nemesis. The rest concerned their current case. A budding romance, gender politics, workplace drama and perusing a career are all familiar to most fans. So is being out of your depth and having to rise to the occasion to defeat problems that seem insurmountable. Diana Prince could be a Wonder Woman all on her own like real life women are, and that's extremely relatable. I feel youÂ’d be better off either altering these characters to be believable threats to Diana or ignoring them entirely to jump. The Diana Prince ID is just an unnecessary hoop to jump through for this outcome. No one's pushing for Batman to lose his martial arts of detective skills when he's outside the Batman suit or for Superman to lose his powers when he's Clark Kent. Again, that was her job as an ambassador. Not true either, 90% of her dialogue was 'Sam and Diane' banter with Nemesis. It wasnÂ’t so much Banter as Tom being a sexist prick who either complained about how he hated Diana Prince or made revolting comments about WWÂ’s body. And we were supposed to find this charming for some reason. The romance was poorly written and worsened by the bad stories surrounding it. A budding romance, gender politics, workplace drama and perusing a career are all familiar to most fans. So is being out of your depth and having to rise to the occasion to defeat problems that seem insurmountable. Diana Prince could be a Wonder Woman all on her own like real life women are, and that's extremely relatable. Again, all done before without the secret i.d. and all done far better. She wasnÂ’t even shown being happy as an agent. Diana was already a Wonder Woman. This made her less so. She became a the female love interest in a bad rom com. Last edited by Agent Z; 11-07-2018 at 10:26 AM. In my last post perusing should be pursuing. I get it, you don't like the Diana Prince persona and that's fine. I do and that's fine too. Do you read Hulk? The only good thing about Marvel's constant reboots and renumbering are the availability of so many different takes on a character. Totally Awesome, Savage, Incredible, Indestructible, Immortal, if one version of Hulk doesn't do it for you, another one is sure to come down the line in a year or two that might. Consistency is good but so is change. But I don't want a change in Wonder Woman's status quo. I'm perfectly happy with Rebirth. All I want is for Diana's adventures to be as broad and varied as they once were and I don't want aspects of her mythos jettisoned because they're currently out of vogue with some readers. No Diana Prince isn't essential, but I do feel she adds another component that was always meant to be there. That's why she's in the Wonder Woman film. She has value. Last edited by Koriand'r; 11-07-2018 at 10:59 AM. Interesting with Marston's version in the Newspaper comic he wrote a another version of Diana not buying the original Diana's Prince id. Some of these are cannon to the original comics. Another way that I'm suprsied people haven't done is why can't one of the gods give her the papers. I mean they are the ones who asked for the contest why can't the winner also get paper to where Steve is from? Now if we ever did get the reason why she picked the name Prince why can't Steve's mom be named Prince? Now what actually do they mean secret id? I just think it would be something she uses time to time. Buying a house, doing everyday things. I mean if we are talking about money why not giving amazon artifacts to the museum? Or actually working for the museum? Please sign this so we can at least show DC we want Legend of Wonder Woman part 2. Interesting with Marston's version in the Newspaper comic he wrote a another version of Diana not buying the original Diana's Prince id. Some of these are cannon to the original comics. Oh yeah, I had forgotten all about that! Another way that I'm suprsied people haven't done is why can't one of the gods give her the papers. I mean they are the ones who asked for the contest why can't the winner also get paper to where Steve is from? Now if we ever did get the reason why she picked the name Prince why can't Steve's mom be named Prince? It's a valid idea. Seems a little mundane for gods to me, but valid. And you know, it'd be nice to know that even the gods aren't immune to bureaucracy. Now what actually do they mean secret id? I just think it would be something she uses time to time. Buying a house, doing everyday things. I mean if we are talking about money why not giving amazon artifacts to the museum? Or actually working for the museum? Most of us here are defining "secret identity" as being an identity on the level of "Clark Kent;" there's a social security number, a full time job, photo albums from high school, taxes, jury duty, and so on. It's a full blown life that stands totally on its own, completely removed and separate from the heroic identity. When most of us say "civilian identity" what we mean is a form of identification Diana uses for normal, day-to-day things like buying food, movie tickets, hotel reservations, clothes, stuff like that. This identity has a "normal" name (it's not like it says "Wonder Woman" on the driver's license) and a bank account but it's not a full blown life with taxes and a deep background. It's there so the hero can take a day off and buy a bag of chips. This actually was a thing. During that 1980s pre crisis period where Aphrodite gave everyone in the world including Wonder Woman herself amnesia of all past continuity, brought in a new Steve Trevor and had Diana redo the whole 'find steve, do contest' bit. Aphrodite gave Diana the blessing of falsified identification establishing that she had been a fighter pilot named Diana Prince from Hawaii who was transfering to Washington DC. It's there so the hero can take a day off and buy a bag of chips. Knowing Diana, wouldn't she rather buy a box of ice cream? Why can’t Diana paid taxes? Now if we did give Diana a job it should still be something wouldn’t it be something like a self defense teacher? Now if the Gods were to give Diana Id papers. It’s hsoudnt be anything false. I really would like that they focused on her out of fish roots. So instead she has immigrant papers. Now if we want to know where she comes from why not since Paradise Island a real island in the comic world . Simple be a uncharted yet heard of island from centuries ago. That way Diana doesn’t have to reveal to much. I would make her a pilot who runs her own small airplane service--takes odd jobs and carries people or packages to places around the world. That allows her some liberty, she's her own boss, and she can go to places all over the world. And the different jobs she takes brings her in contact with all sorts of people. That's a job that fits Steve Trevor much better than Diana. To me, there are several storytelling advantages for Diana to be a "public" superhero. One is that it fits better with her role as emissary (or teacher or embassador) from the Amazons to Man's World. A second is that it serves to differentiate her from Superman and Batman. A third is that permanent skulking and lying doesn't fit with Diana's truth aspect. A fourth is that it opens up the need for Diana to ask for help from others when she really needs to go incognito, like when she asks Black Canary for help in Gail Simone's run. That gives the possibility for fun character interactions. 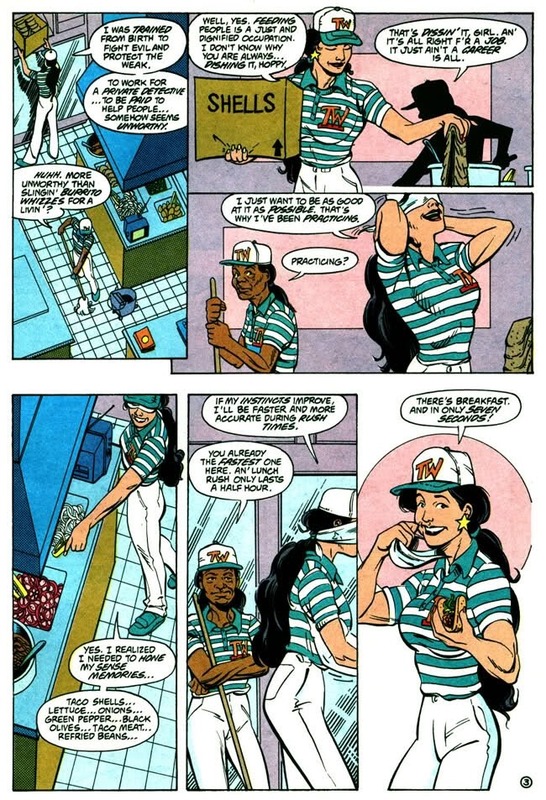 If Diana got her secret identity again, she should get her job back at Taco Whiz. Last edited by LordUltimus; 11-08-2018 at 04:49 PM. Sure Superman and Wonder Woman have Truth written into their code of ethics, but somehow I think their philosophy is about something other than secret identities and it's a much deeper kind of Truth they want. As John Lennon sang, "Gimme Some Truth." The gods wear many masks and no one belief system can explain all the mysteries--what is truth? I think Truth is mutliple choice--like the chronosynclastic infundibulum in Vonnegut's SIRENS OF TITAN where all things are true, even when they contradict. Well, Clark's a hypocrite for a lot of reasons, not the least of which is his habit of lying even when he doesn't have to. But he *is* Clark Kent. He *did* grow up in Smallville and decided to become a journalist. He *does* have photo albums and all the rest of it. "Clark Kent" isn't a lie, it's a secret. With Diana, the secret identity would be a complete and total falsehood....and what purpose does it serve her? It doesn't really add anything she can't already do or have. She already can have "civilian" friends who don't work for Argus or wear capes. She already can go out for dinner. She can do all those "normal people" things without the baggage of maintaining a full blown secret identity. The only gain here seems to be putting a troupe in her mythos just because other heroes are doing it.